Pregnancy, with or without additional complications, constitutes a high-risk condition for complications of influenza infection and warrants early intervention with neuraminidase inhibitors such as oseltamivir, if influenza is suspected. Treatment should not be delayed for laboratory confirmation. In South Africa, the high burden of HIV infection is a further complication. Further information on pH1N1 in pregnancy in South Africa was provided from an analysis of 11 deaths reported to the National Committee on Confidential Enquiries into Maternal Deaths in South Africa between July and September 2009.3 One woman was primigravid, and the mean gestational age was 31 (range 22 - 38) weeks; 9 cases were in the third trimester of pregnancy. Four or 5 cases had underlying anaemia, 2 were diabetic and 1 was asthmatic. Four of the 8 patients who were HIV-tested were positive, and all 4 had CD4 counts <200 cells/µl. None of the HIV-infected women was on antiretroviral therapy. Seven cases required ventilation. Most cases presented with cough, fever, diarrhoea, muscle aches and breathlessness, and had symptoms for 3 - 4 days before seeking medical attention. In some, severe illness (pneumonia and respiratory distress syndrome) developed very rapidly. Laboratory tests for H1N1 were not performed on admission to hospitals because H1N1 was not initially considered. 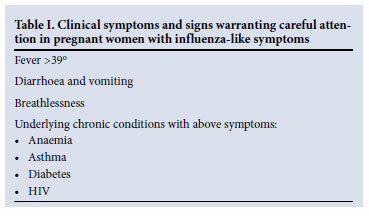 It is now universally accepted that pregnancy, with or without additional complications, constitutes a high-risk condition for complications of influenza infection and warrants early intervention with neuraminidase inhibitors such as oseltamivir, if influenza is suspected (Table I). Treatment should not be delayed for laboratory confirmation. Although not ideal, delayed administration (over 48 hours) could still reduce maternal morbidity and mortality. The regular dose of oseltamivir is 75 mg bd for 5 days; however, if circumstances warrant it, a higher dose of 150 mg bd for a longer period may be necessary. Laboratory confirmation is by PCR; presently available point-of-care tests such as antigen detection are inadequately sensitive and should not be relied on to confirm diagnosis. Caesarean section does not appear to improve maternal outcome4 and is not recommended. However, early delivery in the third trimester may be necessary if the patient requires mechanical ventilation.